‘Shalabh’ means grasshopper or locust. The sages of ancient India lived close to nature and carefully observed the natural world and the behavior of various creatures around them. They realised that man could learn many secrets of health and rejuvenation from nature and hence many asanas are derived from nature; mountains, trees, animals, reptiles, birds and even an insect like the grasshopper! Lie face down, chin resting on the ground with the legs straight out behind you and the hands side by side under the thighs. For the half locust inhale as you raise the left leg. Don’t twist the hip or bend the knee. 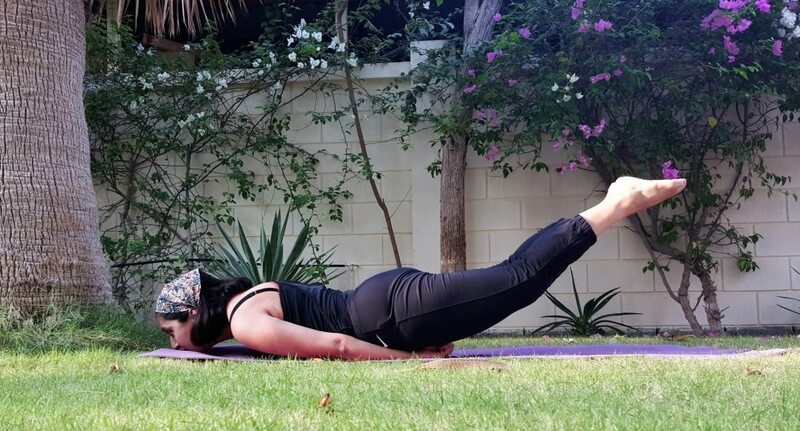 Retain the breath as you hold for atleast 5-10 seconds .Exhale as you lower the leg. For full locust from step 1, breathe in and raise both the legs as high as possible. Breathe and hold for as long as you can. Exhale and release legs to floor then relax on abdomen. Keep both the legs aligned together. Don’t let your thighs touch the floor. Don’t jump or throw the legs up into position. Strengthens the muscles of the back, hips and the back of the thighs. Brings a rich blood supply to the spine. Tones the nerves and muscles, especially in the neck and shoulders. Increases intestinal functioning, strengthening the abdominal walls. Regular practice of Shalabhasana relieves back pain and sciatica. When you first practice the locust, you may be disappointed to find your feet rise only slightly from the floor .Don’t be discouraged. This will improve rapidly with practice.